FOR A LONG YEAR, I worked on my first book, The Sketchnote Handbook. I spent 3 months writing my proposal and negotiating the contract, 7 months writing, sketching, illustrating, scripting and shooting the book and video. It was the hardest, most demanding project I've ever done. 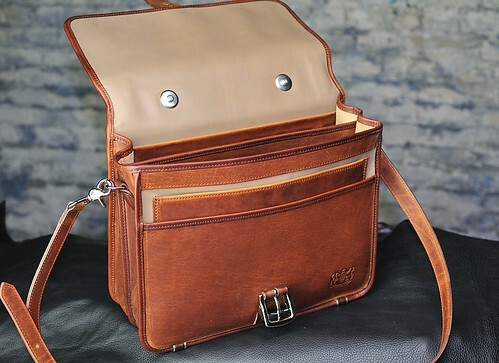 When it was complete, I wanted to get something special for myself as a reward and a reminder — I chose a beautifully hand-crafted custom leather briefcase from Mitchell Leather in Milwaukee's Third Ward. 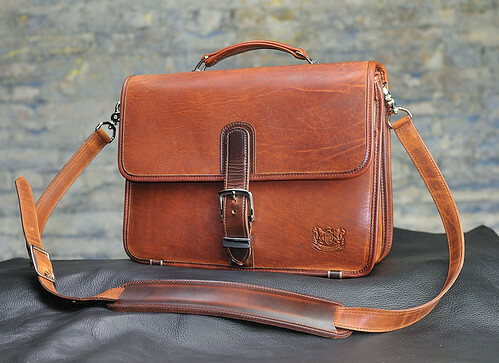 A few weeks ago I picked up my completed compact briefcase, and am thrilled with the quality, the detail and of course the wonderful leather scent! 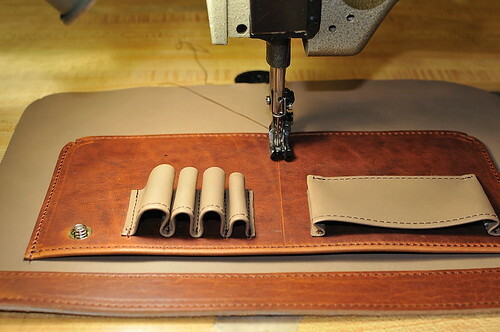 For the majority of the briefcase, I chose Horween leathers: Cognac Dublin, a medium brown leather that's tough, yet supple and classy, and for the darker highlight, Horween Brown Chromexel (CXL), also tough and beautiful. For the internal liner I chose a lighter weight tan leather, and the finishing touch — nickel-plated brass hardware for contrast. The process began with my order. 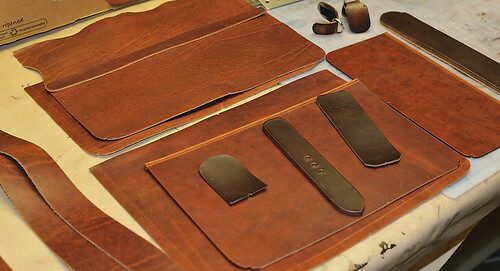 I spent time with David, selecting my leathers and hardware and telling him how I would be using the case. 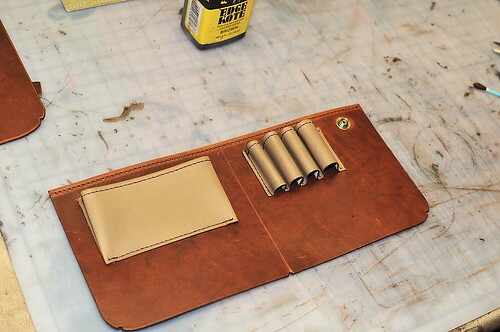 This case would become my daily carry-all, with enough room for my main items and that's all. I have a tendency to carry more than I need, so this was a way to limit my daily items. I have a Timbuktu backpack for heavy loads when needed. Daily items included: a 13" MacBook Pro (or Air), power supply, a full-size iPad, one large Moleskine notebook, one or two pocket Moleskine Sketchbooks for sketchnoting events, pens and pencils, space for cords and adapters and enough room for a book, magazine or a folder of papers for projects. 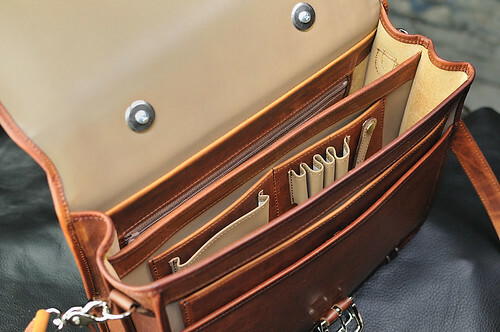 The Mitchell Compact Briefcase was a perfect fit for all of the items I need to carry and nothing more. Once I had the model, leathers, hardware choices and details settled, David took a deposit and put me on the waiting list. 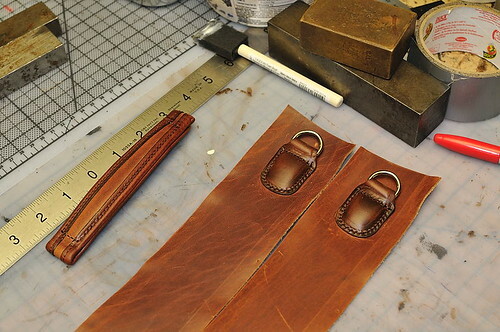 In August, about 7 months later, I was curious, so I paid a visit to Mitchell Leather. David happened to be starting my case, so we went up to the factory and showed me the raw pieces, getting prepped for construction. 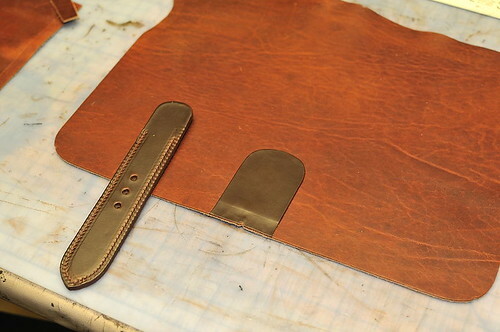 The final piece turned out great — colors, leather weight, and of course, that leather scent really sealed the deal. 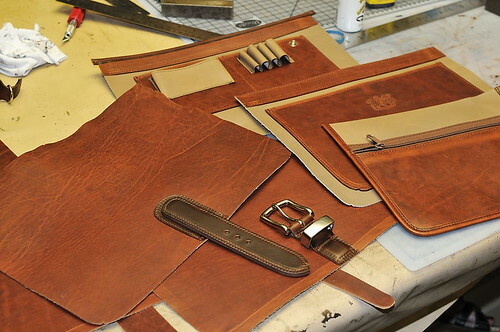 If you'd like to see all of the photos from the construction process, check out the complete Mitchell Briefcase Flickr set. Having the case for a few weeks now, I'm finding it's a perfect size for what I really need and nothing more. 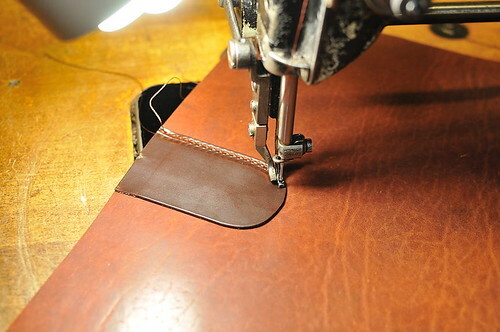 By getting the size just right, the case has kept my load light and manageable. 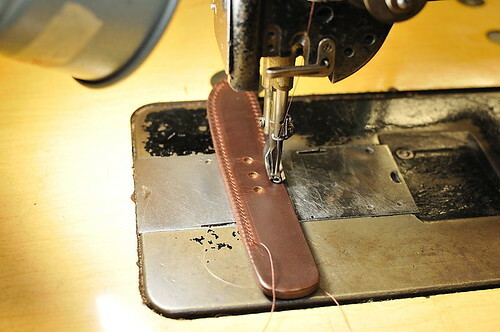 My challenge: to accept the normal wear, tear and markings on the leather that will give the case personality and character. Starting with a perfect case makes this hard, but as I see the case getting worked in, I'm loving it even more. GOOD BARBECUE is hard to come by in Wisconsin, especially after being spoiled by the amazing stuff I have every year in Austin, Texas at SXSW Interactive. 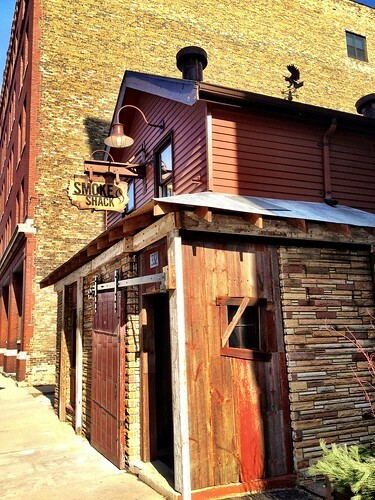 I've been watching development of a new barbecue joint in Milwaukee's 3rd Ward called The Smoke Shack. The building has been under construction for several months. I couldn't wait for the space to open so I could give their barbecue a try. Today, I happened to visit during The Smoke Shack's first public lunchtime opening and it was amazing. I chose a brisket sandwich, and enjoyed experimenting with the various sauces at the bar — tangy Texas, smoky Kansas City, zippy North Carolina and the balanced House. 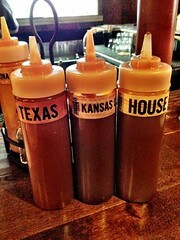 All of them were great, but Smoke Shack's House sauce was my favorite. 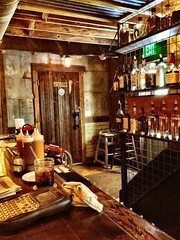 The interior and exterior design were also superb, as the designers made use of salvaged wood and metal objects to give Smoke Shack an authentic vibe. I was brought right back to those warm spring days at Stubb's BBQ in Austin. Ribs are only available after 5pm because they're cooked during the day and just aren't ready until dinner time. 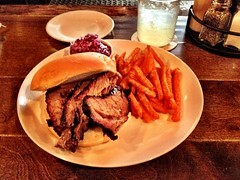 But man, their beef brisket was tender and juicy, so don't be afraid to try out a sandwich at lunch. I'm pleased to see The Smoke Shack making a statement in the 3rd Ward, helping my city of Milwaukee to be an even cooler, tastier place to live. If you're in Milwaukee, check out The Smoke Shack! TWO YEARS AGO, I was at Austin airport, waiting for a plane with my friends Brian Artka and Derek Dysart when the idea for the Milwaukee Beer & Brat Bash was born. We were hanging out in the departure lounge, coming off a great week at SXSW Interactive in Austin, TX. We ate our last breakfast tacos while recalling our experiences when Brian suggested we throw our own Milwaukee party for everyone at SXSW. It would be an opportunity to share a little Milwaukee culture with the variety of people at SXSW and create a fun atmosphere for them to meet each other and us. Most of all, our party idea would be different than every other party at SXSW. We loved the idea, but as ideas often do, it hibernated for several months. In December 2009, the idea re-awakened in Brian's head, as he prepared for SXSW 2010. He asked me if I was interested in taking the Milwaukee party idea seriously. I was game, and so were several other Milwaukee SXSW attendees and a friend from Austin. So, in January, we researched venues, food and sponsors. We were going to make it happen. A contract for a venue was signed and money put down, even though we didn't know how many (if any) people would attend the event, or without having all of the needed sponsors lined up. If this idea went bad it could have been costly, though bearable. For the first event in 2010, we arrived in Austin excited about the event, inviting everyone we saw to the Bash. Eventually our little Bash was mentioned in a variety of online newspapers and on Twitter accounts — a pleasant surprise! When the day came it was rainy, so using the Cedar Door patio was out. The staff invited us to use the restaurant to serve our 200 guests beer brats, potato salad, cookies, and Milwaukee beer, all while enjoying the company of other attendees. My favorite story of the day was from a guest who said his bratwurst brought back fond memories of Oakland A's games. As a kid, he would spend his summer days watching baseball and eating his fill of brats. With a belief in ourselves and lots of hard work, our first Bash was a success. In late 2010, with experience and a successful Bash already under our belts, we worked out the details, convinced sponsors to join the fun and put on another great Bash. 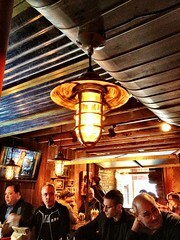 For the 2nd annual Bash, we finally had the Cedar Door's sunny patio as well as the interior of the restaurant. This helped us serve 360 guests delicious Milwaukee beer-soaked bratwurst, regular and Pretzel buns and Tofurky brats for our vegetarian guests. Of course we had potato salad, cookies and Milwaukee beer to round out the Bash menu for 2011. For 2011, we raffled bags of coffee from Milwaukee's Stone Creek Coffee and 18 Milwaukee Beer & Brat Bash t-shirts printed in Superbowl Champion Green Bay Packer green & gold. The Bash was a hit. SXSW attendees had something fun and different to enjoy during the day. We were able to share a little Milwaukee culture and love with our friends and colleagues in Austin. I was sick and couldn't make it to Austin for the event, but the team stepped up and did a great job of making the Bash a huge success. I was able to invite many of my friends to the Bash remotely and watch the event over a UStream channel, set up by the team. The key lesson learned from the Bash? Take initiative and make something happen. Nobody in Milwaukee or Austin gave us permission. We decided to do it for ourselves. We had no experience organizing an event, but we had experience in other areas of life and business, which we used to make the Bash happen. 1. Use a collaboration tool for your team. One of the best things we did was to create a Basecamp project for the Bash. It became a central hub where discussions happened. Basecamp worked well via email, freeing the team to reply on the web app or on a mobile device. Basecamp threads from '10 were very helpful in planning the '11 Bash. 2. Keep the team small and delegate. Because our team was small and everyone pitched in, the load was never overbearing for any one person. This year when I had to recover from a sickness, having others there to take up the organization was critical to making the event happen even with me out of commission. 3. Don't be afraid to ask for sponsorships. If you decide to seek sponsorships, ask everyone you can think of. We asked many more companies and individuals to help than accepted the opportunity. We also were open to small donations from individuals and small businesses, because every dollar helps. 4. Designate one person to handle the funds. It might be tempting to have all sorts of team members accept money, but we found having one person handle funds worked best and kept the process simple for our team and sponsors. 5. Say thank you. After the event we made it a point to contact every sponsor and say thank you for their help, with a report about the event and links to event photos and new coverage from local radio and news outlets. Thanks go to the teams for the 2010 and 2011 Bashes: Brian Artka, Derek Dysart, Tracy Apps, Hung Nguyen, Andy Wright, Cindi Thomas and Kevin Ciesielski. Thanks also to our sponsors who made the Milwaukee Beer & Brat Bashes happen. We appreciate you all. 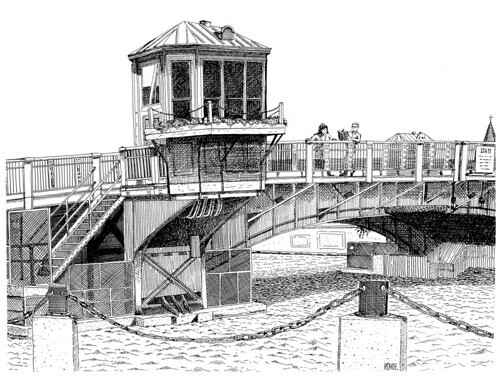 Last week I came across an ink illustration of a Milwaukee bridge from 1989. I was a graphic design student at Milwaukee Area Technical College, still learning my craft. I still have fond memories of walking with my drawing class to the State Street bridge in Milwaukee to draw on warm spring mornings. The entire drawing class trekked out to the bridge each day of class. We each found a spot and we drew like crazy. I inked this piece with a Koh-I-Noor Rapidograph ink drafting pen on heavyweight drawing board, using some freehand and a fair amount of help from a triangle. The most interesting thing learned while drawing this piece was to have patience and enjoy the process. Something of this detail level could have driven me crazy, yet by having to tackle it a little every day while enjoying the process made it achieveable.